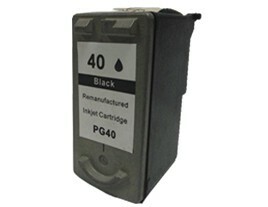 Order your top quality Canon PG-40 Compatible Canon Black Ink cartridges online for top discounts. Buy 2 - 4 cartridges for outstanding discounts or over 5 cartridges to capitalise on even better deals. Canon PG-40 Ink cartridge is unparalleled in its quality, providing the print out with flawless lines and deep shades with an unsmudgable end product. Canon PG-40 Compatible Canon Black Ink is the perfect black ink for your work or home print outs. Whether printing images, script or diagrams, Canon PG-40 Ink is the most cost effective route to take for your printing needs, while maintaining a second to none level of quality for your print outs.